【Luxury & Comfortable Bath Pillow】- This pillow is made from thick high quality foam and is extremely comfortable and super soft. 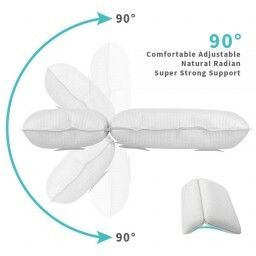 Very lightweight and flexible pillow for bathtub. Support your head, neck and shoulders and no to touch the cold bathtub. 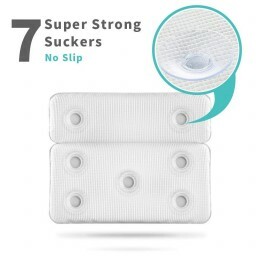 【7 Super Strong Suckers】- With 7 super strong suckers to install and it is completely firmly fit in the bathtub. It would attach easily to any tub and easy remove. 【Waterproof & Anti-slip】- The bath pillow is waterproof; anti-slip surface, your head will not slide down from the bath spa pillow. 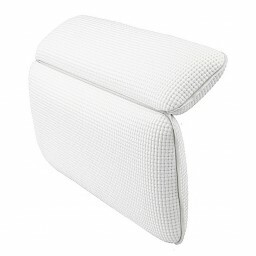 【Large Size with 2 Panel & Healthy】- The oversize 14.6" x 11.4" pillow with orthopedic two-panel design that comes to this comfy bath pillow. Provides head, shoulder, and neck support. Anti-bacterial,chemical and odor resistant, simple to clean without worry of wear and tear. 【Ideal Gift for All】- The bath foam pillow is a ideal gift for your loved ones or friends, the most practical action to bring them the most warm feeling, enjoy relaxing bath time. Jhua Non Slip Bath Pillow,... https://www.amazon.com/dp/B07BRNYMYL?ref=yo_pop_ma_swf. Super relaxing bath time, rose Bath bomb and new bath pillow. Merry Christmas to me!